Press CTRL + D to add the file called frmSquares.vb from the above folder into your project (or right click on the project and choose to add it as an existing item). The idea is that when you click on the Go! 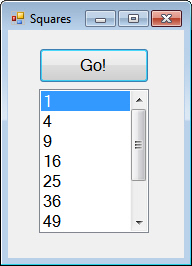 button your code should create a list, add the first ten squares to it and then display the list items in the list box as shown here. Please turn over for how to proceed! Next, loop from 1 to 10 adding the square of each integer to the list called squares. When you've got this working, close down your application and any forms that you have open.